The Aristocrats – Bryan Beller, Guthrie Govan and Marco Minnemann – are preparing to release their very first live CD and DVD, BOING, We’ll Do It Live!, just in time to awesomize the holidaysfor musicians everywhere. And get this: the 5.1 surround audio mix was done by Steven Wilson of Porcupine Tree! I was lucky enough to catch the Aristocrats’ very first gig back before they even had a name, and I can’t wait to crank the new DVD up to neighbour-enraging levels at home. 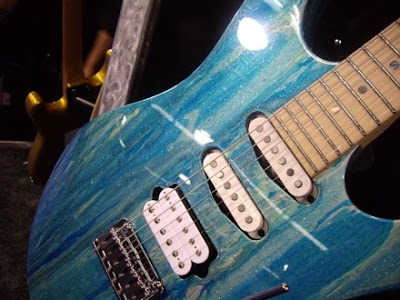 There’s more info about the DVD below, but before we get to that, Guthrie has shared a few words on the custom Charvel he’s been seen playing recently. I have some terrible news. 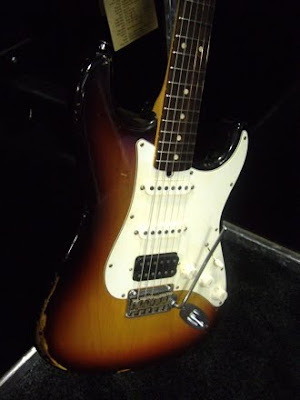 Two of my beautiful Suhr guitars have been stolen. My first Suhr “modern” with the sunburst quilted top (Serial #8370), and the Suhr strat with the double color paint and the mirror pick guard (Serial #2653). It’s green or purple, depending on what angle you look at it from. I am so deeply upset about this. Aussie guitarist and Suhr artist Chris Brooks is available for masterclasses. Stop by his site and register your interest in having one in your town! I had an awesome time strolling around the Suhr booth at NAMM, and since I got so many killer pics of the display I thought this might best be presented as a photo special. 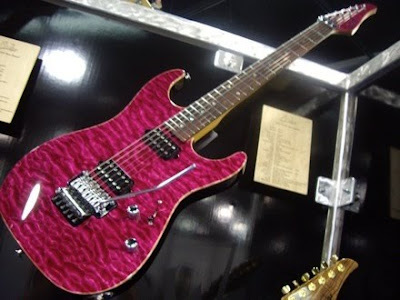 As always, you can order your Suhr with pretty much any appointments you desire, so check out their site for more info, after you’ve wiped the drool from your keyboard. 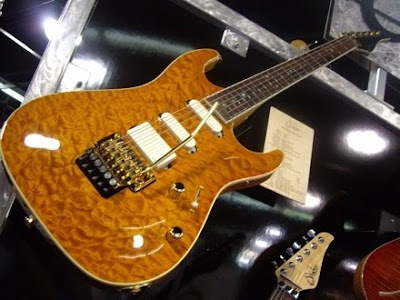 Elixir Strings has published this nice little press release about their strings being used on the Suhr 2009 Limited Edition Modern Carved Top guitar. 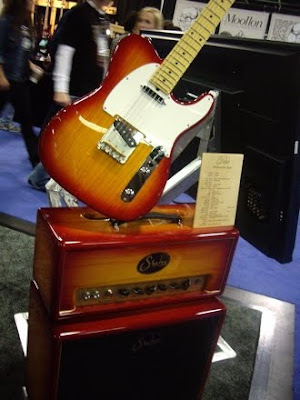 As the release points out, Suhr has been using Elixirs for over half a decade, so I guess the real point of the press release is to draw your attention to two things: a) Elixirs are so awesome that a company as awesomely awesome as Suhr uses them on all their guitars, and b) look at that monstrously awesome 2009 Limited Edition Modern Carved Top! 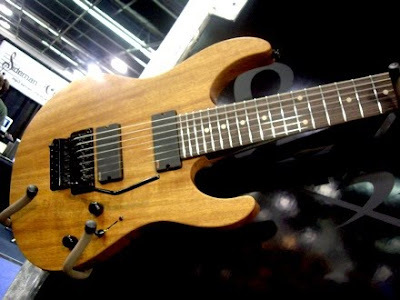 Suhr Guitars’ newest model has a luxurious look and feel. 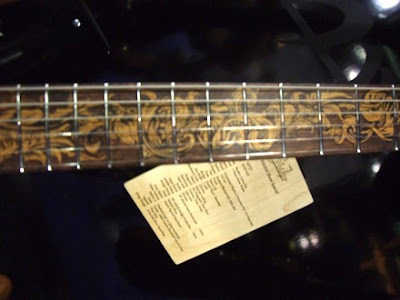 Unique features include a 3/4 inch maple top that is glued onto an alder body and commemorative inlay work on the fingerboard. With all this attention to detail going into every guitar, the company knew it had to make the right choice when choosing strings. Elixir Strings proved to be the right choice because of their superior sound quality and long-lasting playability. 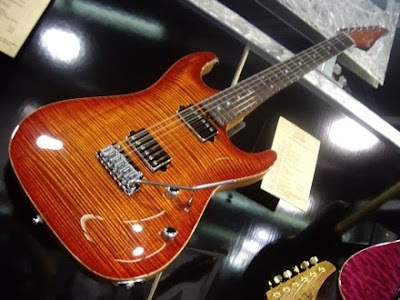 Each 2009 Limited Edition Modern Carve Top guitar features a set of light gauge electric Elixir Strings with ultra-thin NANOWEB® Coating, thus providing the best possible sound to both users and potential customers of more than 100 authorized Suhr Guitar dealers worldwide. Only 75 Limited Edition Modern Carve Tops are being manufactured. 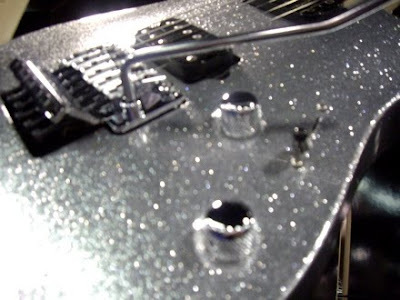 The guitar retails for $5,900. For more information, visit their web site at http://www.elixirstrings.com/. 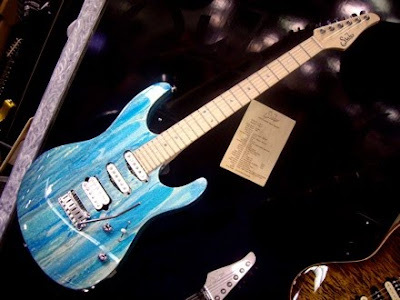 CLICK HERE to see Suhr guitars on eBay. 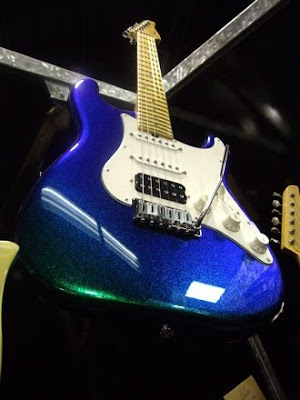 CLICK HERE to buy Elixir Nanoweb guitar strings from Guitar Center.